At the Congress, representatives of the national federations discussed a number of important issues, diversifying the development of arm wrestling: summed up the results of last year's work, discussed the prospects for the development of our sport. So, one of the first issues on the agenda was the adoption of new member countries of the federation, which became Mauritius and Portugal. The membership of the Georgian and Korean federations was also re-confirmed. An important moment was the speech of the President of the federation Assen Hadjitodorov, who focused on the full conditions for the entry of the para-federation into the Sport Accord: "In order for the most famous sports organization in the world to include para-armwrestling, very little is needed. Now the world championships for athletes with disabilities are visited by participants in 39 countries with the required number of 40. Therefore, for the productive work of our organization it is worth a little more active". The participants of the Congress heard the results of the work of the continental federations over the past year and got acquainted with the further work plans, after which the head of the Referee Panel of the federation Leonard Harkless said the pleasant news: according to the results of the annual test the championship will be served by 20 Master referees, while the total number of referees - 40. Also the problem of doping was discussed - the anti-doping staff of the federation prepared materials that clearly demonstrate the dynamics of the number of doping-positive athletes, and demonstrated the work of a new system of storage and management of anti-doping data. The WAF Code has been added with several new items. For example, for athletes with disabilities, two more classes were introduced - athletes with upper limbs that are standing up, as well as athletes with upper limbs that are struggling to sit. The position of the side referee has been changed, which is obliged to move aside before the start team (except for the duel in the outfits and the referee's capture). This change is dictated by the requirements for high-quality video. 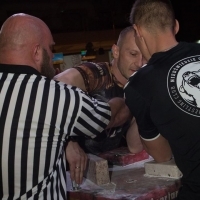 The turning point of youth arm wrestling can be the offer of the Polish Armwrestling Federation, which consists in allocating a separate age class for juniors up to 16 years of age. The Federation asked to share experience and together with all to work out procedure of entering of a new class that in 2019 youth will pull in a new category. Following the results of the Congress, the country that will host the World Cup in 2021 was determined, and now the list looks like this: 2018 - Turkey, 2019 - Poland, 2020 - Romania, 2021 - Bulgaria. Tomorrow there will be a procedure for weighing juniors and youth, masters’ category and disabled sportsmen, as well as technical and continental meetings.